Amber Stevens first met Andrew J. West on the set of ABC'sin 2008, where they played an onscreen couple. Amber Stevens first met Andrew J. West on the set of ABC's Greek in 2008, where they played an onscreen couple. The chemistry was real, and five years later, Andy surprised Amber with a proposal surrounded by friends and family. When the pair started planning their wedding, they sought out an intimate indoor venue, and stumbled upon Carondelet House in Los Angeles. "It was the first place we visited," says Amber. So on December 5th, 2014, they invited 98 guests to join them for a candlelit celebration of love, filled with DIY details and photographed by Steve Cowell. 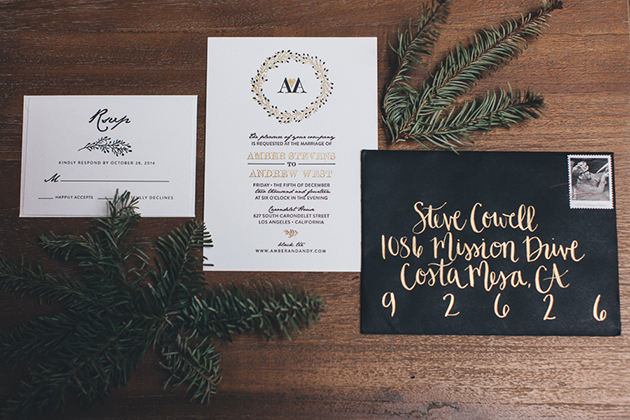 The couple worked with a friend to design their save the dates and invitations, including a seasonally-inspired custom crest. Amber's tiered lace gown by CB Couture was actually the second she purchased. "When I went to have the first one I bought altered, I realized I hated it. The tailor told me to get a new one instead of trying to turn the old one into something else, and I'm so glad I did!" she says. Her ball gown was the perfect look for the wintery affair, as well as a fabulous match for Andy's shawl-collar tuxedo. She paired her gown with diamonds by Greene & Co., and tied her grandmother's diamond and sapphire ring to the underside of her dress as her "something borrowed, something blue." 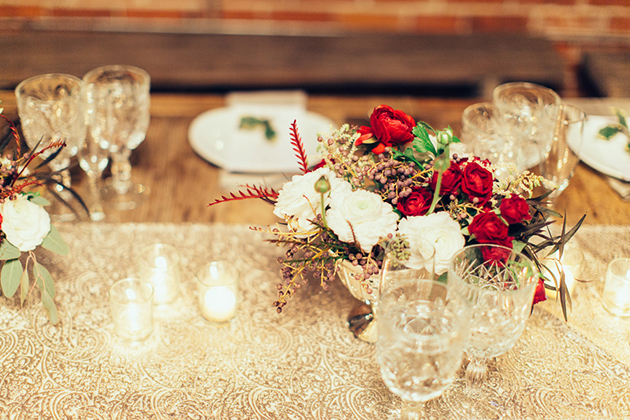 All the flowers stuck to a palette of red and white, including roses, ranunculus, and scabiosa blooms. The theme for the evening was simple: Candles everywhere! 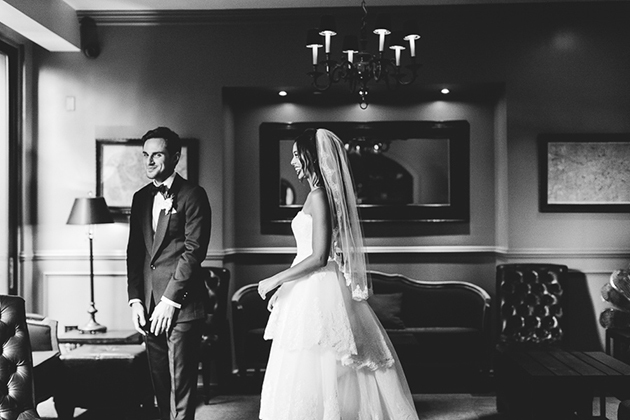 The ceremony, in a room full of exposed brick, literally glowed. Amber's sister, the only bridesmaid, wore a custom black gown inspired by a design the bride found on Pinterest. She carried a bouquet of red roses, peonies, and succulents that complemented the bride's. The couple worked closely with their officiant to personalize the ceremony and selected traditional vows. "We liked the thought of saying vows people have been exchanging for generations," says Amber. Less traditional, though, were the musical selections. "Married Life" from Up!, the theme from Love Actually, and the Beach Boys all made the cut. A nod to the holiday season, guests' table assignments were written on red ribbon and tied to ornaments displayed on a frosty Christmas tree. The warm, inviting reception featured metallic linens that shone in the candlelight. Amber and her mom worked together to create the patterned table runners, topped off with simple centerpieces in silver vessels. Guests sat down to sip pomegranate margaritas and Old Fashioneds and tucked in to a family-style dinner of chopped salad, kale Caesar salad, braised short ribs, seafood paella, butternut squash ravioli, roasted winter vegetables, and chive pommes puree. "The food was absolutely outstanding. One friend even asked us if we could get him the recipes!" the bride laughs. The simple one-tiered cake was brushed with gold and topped with a deep red peony. "We let the baker decorate it however they wanted. All we cared about was the flavor!" says Amber of the vanilla cake with raspberry jam filling. Mid-reception, guests joined the bride and her father on the dance floor for a New Orleans-style second line, complete with white umbrellas and classic jazz. 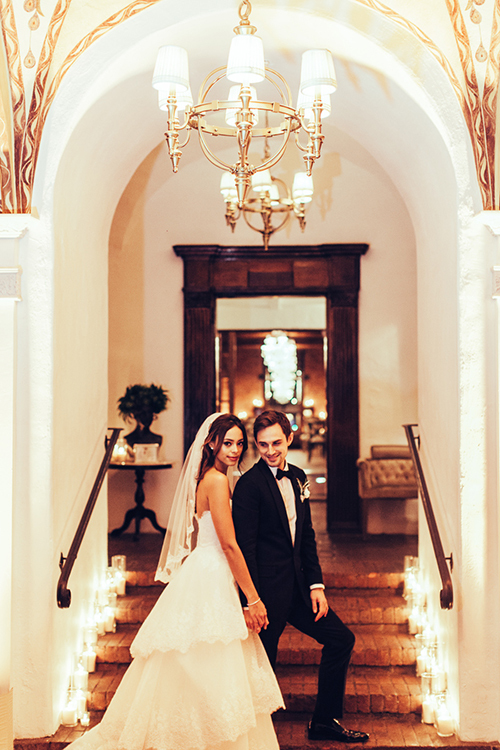 The couple opted for a sunny honeymoon in the Dominican Republic. And of course Amber has advice for busy brides-to-be! "Give yourself plenty of time to plan," she says. "That way you can relax during the few weeks leading up to your big day!"